Indonesian President Joko Widodo turned his attention back to state affairs over the weekend during the three-day “quiet period” before more than 192 million voters cast their ballots tomorrow. Mr Joko was in Riyadh on Sunday where he met Saudi Arabia’s King Salman. At their meeting, Mr Joko and King Salman agreed to enhance bilateral economic cooperation, particularly in the energy and tourism sectors. The Saudi monarch acknowledged Indonesia’s leadership in the Islamic world, Indonesian Foreign Minister Retno Marsudi said in a statement. “King Salman also conveyed his high appreciation over Indonesia’s leadership in keeping regional and world stability,” she added. Mr Joko, in turn, expressed gratitude to Riyadh for granting an additional quota to allow 10,000 more Indonesians to go on the haj. His talks with Energy, Industry and Mineral Resources Minister Khalid Al-Falih were on Saudi investment in the oil and gas, and petrochemical sectors. One of the issues discussed was the possible cooperation between Aramco and Pertamina on a refinery project in Cilacap, Central Java, said Ms Retno, who was in the Indonesian delegation together with presidential chief of staff Moeldoko, presidential special staff Abdul Ghofarrozin and Indonesian Ambassador to Saudi Arabia Agus Maftuh Abegebriel. 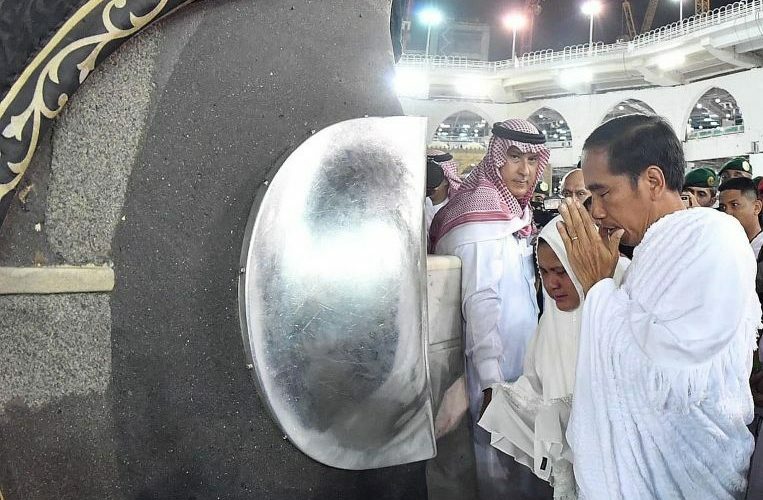 After the meeting, Mr Joko headed to Mecca with First Lady Iriana to perform the umrah, or minor haj pilgrimage. With him was cleric Abdul Karim Ahmad, who first taught him to recite the Quran, according to information from Mr Joko’s campaign team. Also in Mecca for the umrah was Mr Sandiaga Uno, the running mate of Mr Joko’s presidential challenger Prabowo Subianto, and his wife. Meanwhile, Mr Prabowo visited the grave sites of his parents in Jakarta. “He visits their graves and prays routinely, and this is a form of tradition for him,” Mr Irawan said. Mr Prabowo also attended an exhibition of the works of Dutch photographer Ted van der Hulst titled Jak Cat, which featured the former general’s pet cat Bobby. “Wow, is this the photo of Bobby? It’s very nice,” he said at the Tugu Kunstkring Paleis Art Gallery in Menteng, Central Jakarta. The feline with white and grey fur has captured public attention since it was seen accompanying its owner at meetings held at his home. As for Mr Joko’s running mate, senior cleric Ma’ruf Amin, he held a Quran recitation at his house in Menteng on Sunday. Yesterday, he and his wife were at a nearby park with their three-year-old granddaughter.